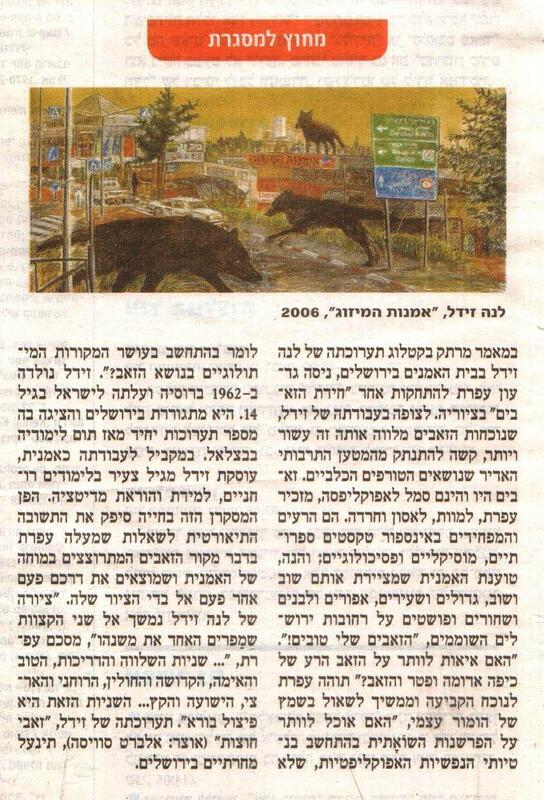 In a fascinating article in the catalogue of Lena Zaidel’s exhibition at the Artists’ House in Jerusalem, Gideon Ofrat attempted to investigate the “riddle of the wolves” in her paintings. To the observer of Zaidel’s work – which has been accompanied by the presence of wolves now for over a decade – it is difficult to detach from the huge cultural baggage borne by the canine beasts of prey. Wolves have been and are the symbol of an apocalypse, Ofrat reminds us, of death, of tragedy, and of terror. They are the fearsome bad guys in countless literary, musical and psychological texts; but here, argues the artist – who repeatedly draws them spreading throughout the desolate streets of Jerusalem, large and hairy, gray, white and black – “My wolves are good!” But, “Should I let go of the bad wolves in the stories of Red Riding Hood, and of Peter and the Wolf?” wonders Ofrat in confronting this authoritative statement, continuing to ask with a drop of self-humor, “Am I able to let go of the catastrophic interpretation, taking my personal apocalyptic tendencies into account, not to speak of taking the wealth of mythological sources regarding the wolf into account?